Disposable Bun Rack Covers 52" x 83" - 15 mic. 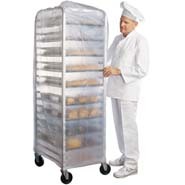 W x L: 52" x 83"
High density poly 52 x 83 15 Microns disposable bread rack Covers are packed 50 per roll and offer an economical way to protect your foodstuffs and bakery bun pan racks. 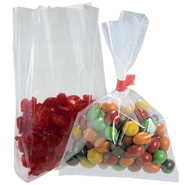 These poly bags are made from prime High Density (HDPE) virgin resin which means that they are FDA approved. The transparency of the bun pan rack covers makes for a clean look and good identification. These are sanitary, full size, and have a Star Seal Top to fit the Bun Pan Rack. Obviously you want to protect whatever you cover so the performance seals help to resist leakage onto whatever you have covered. Packaged in space-saving cases for easy, one-at-a-time dispensing. International Plastics stands behind whatever we sell, so, you know that you will have reliable, consistent quality poly products. A Bakery Rack Cover can also be used as Ultra Large 96 Gallon Trash Can Liners. 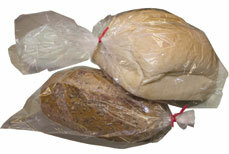 These frosty poly bags are made from prime High Density (HDPE) virgin resin which means that they are FDA approved. Obviously you want to protect whatever you cover so the performance seals help to resist leakage onto what you have covered. These plastic bags are designed to cover a full size bun pan rack. These bakery kraft disposable bun rack covers measure 52" x 83" and are .59 mil thick. These bags are made of high density plastic,and meet FDA requirements for use for food applications These HD Equipment Covers are packaged in space-saving cases for easy, one-at-a-time dispensing. International Plastics stands behind whatever we sell, so, you know that you will have reliable, consistent quality poly products. Bakery 80x52 plastic bags Bun Rack Covers are designed to prevent free standing bakery, restaurant and cafeteria racks from airborne substances.